There’s nothing Mr 8 likes more than water play, so what better experience to buy him for his birthday than tickets to the Monster Slide Festival. What 8 year old boy wouldn’t want to spend the day riding a 300m slip and slide! The venue for the Auckland Monster Slide event was changed from a central location to Whitford – a good 40 minute drive away. Still, the venue change was well communicated and was made for safety reasons. Plus they moved it to a vineyard which sounded like a fabulous idea. We bought a family pass which gave 2 adults and 3 children 6 slides over a 6 hour period. I didn’t opt to upgrade to the queue jumper pass – in hindsight it would have been money well spent. We arrived at 10.45 ready for our 11am entry. There was plenty of parking and the vineyard setting looked magnificent. Opening was delayed due technical problems but by 11.30 we were registered and in the queue for our first slide. The kids were beside themselves with excitement as they watched the first few people whiz down the slide. After an hour of queueing the excitement had worn off a little, but finally it was their turn and they came out the end of the slide fizzing. Even husband declared it to be fantastic. We raced to get back in the queue but it had grown and we knew we were in for a long wait. The sun came out, the temperature went up and with no shade and nowhere to cool off it wasn’t long before grumpiness set in. So when husband appeared through the heat haze with a fist full of icecreams it was a blessed relief. An hour later, the queue had barely moved and the crowd was getting grumpy. The only people enjoying themselves were the people with queue jumper access – those lucky VIPs must have had 5 or 6 slides each in the time it took the rest of us to queue for just one. Too much queueing and not enough sliding made for grumpy children. Two and a half hours later I finally got to have my first slide and I have to say it was A LOT of fun – although not quite enough fun to forgive the long queues. At this point we, like many others, gave up and headed for home. There were constant promises that the broken slides would be up and running “in 20 minutes” but when we left I’d have to say that looked very unlikely. Big ups to all the volunteers that helped out on the day. They put up with a lot of very angry people and kept a smile on their faces. I believe you shouldn’t judge people for the mistakes they make, you judge them on how they deal with those mistakes. So let’s hope the Monster Slide people do the right thing and refund all the unhappy punters as they have promised to do. Only give the gift of this experience to someone who loves queueing and making small talk with complete strangers. Otherwise do yourself a favour and buy a queue jumper pass. Despite all this if you still plan to go, take drinking water, sunscreen, a sunhat and maybe even a rain umbrella for shade in case you have to queue for 2 hours plus as we had to. Leave your valuables at home or take a waterproof holder to keep them in – there aren’t any secure areas to put bags. Boogie boards are fine for adults – you’ll fly down the slide – but no good for smaller kids. Grab the kids an inflatable ring or lilo as they’ll go much faster and have much more fun. 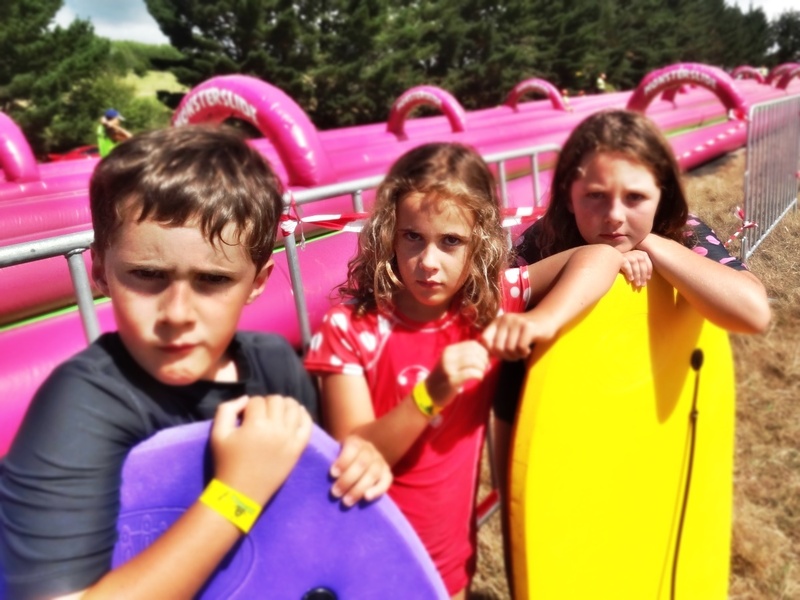 Also the inflatable queue moves much quicker than the boogie board queue – for safety reasons. I hadn’t heard of this before, is it a one off? Sounds so disappointing but if they fix the broken slides and offered shade maybe it’d be better? It’s an annual event. Such a shame to see a business trying to make a go of going something really amazing, but just executing it poorly. I hope it does go ahead again next year, but we won’t be going again.